Angie saw this on my blog and invited me to post it here. The groundhogs are always such a hit with the kids. I hope you will enjoy them as much as we have. 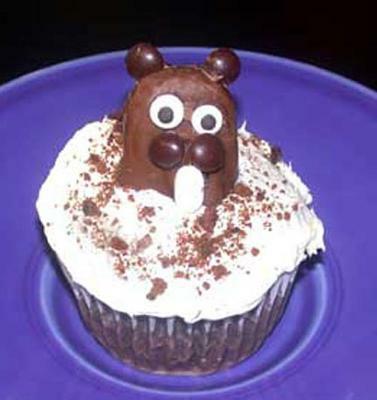 I like to get the groundhog made first. Melt the chocolate (you can microwave - stir every 30 seconds so you don't burn it). Use the melted chocolate to attach the M&Ms ears and cheeks, the candy eyes and the Tic Tac tooth. Prepare a batch of your favorite cupcakes and bake then in cupcake liners to help avoid a mess with the kids. You can even use a cake mix, if desired. Allow cupcakes to cool. Cut a little section out of the centre of each cupcake so you can fit the candy bar down into it. Ice the cupcakes with your favourite white frosting and sprinkle some chocolate crumbs around the top to look like dirt. Just use the sections you cut out earlier. Finally, insert the candy groundhog. kids. I knew my visitors would love them, too. Listen, you guys. Becky has a really great blog with some mouthwatering recipes. What I really enjoy about it is that she illustrates the steps with a lot of photos. You've got to dash over and have a look. Becky, please know you are welcome to add any other great ideas to my site that can remotely fall into this niche - chocolate candy, cakes, cookies, cupcakes, bars, fudge, etc. You get the idea. You're a cooking artist and I'd love to help display your work. Hope to see your work here again soon! P.S. I'm terribly sorry about your health issues. You inspire me all the more to see what you accomplish even though you are unwell. I don't want to be "pushy" or inappropriate, but I was hoping you wouldn't mind if I recommended something to you. If you are not already using some good quality whole food supplements, you may want to consider Leaf Greens and Redibeets. I'm not suggesting they would be a "miracle cure" for you or anything, but they are very good for you and may give your system a very helpful boost. Oops! I just realized some of the links are broken on this page and you couldn't navigate around properly. Sorry about that. I do try to be careful, but sometimes my fingers fly faster than my brain cells. :) They should be all fixed now!